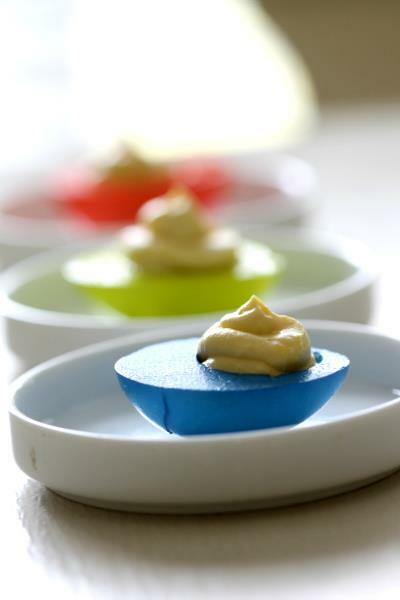 Home » Recipes » Rainbow Recipes » Deviled Eggs that WOW the dinner table! Now that spring is hitting, your kids are no doubt asking you when you are going to dye eggs. And while that is fun (even if a bit messy), you can wow them at dinner tonight with colored deviled eggs , a fun way to enjoy this Easter favorite for young and old alike! Today I snuck in some of these while prepping all the materials for my daughter to dye her own eggs. Of course after having them on the counter a few hours, they are long gone. Hopefully they will be as big of a hit in your home as well! 1) Prep your dye in bowls the way the back of the box says. In this case I wanted a darker egg color, so I used the vinegar method. Now I thought the eggs soaked in the vinegar would change the flavor but it didn’t for me. You can also use lemon juice for more neutral colors or water for more pastel colors. 2) Prep your eggs by removing the shell, cutting down the middle and removing the yolk. Put yolk in bowl for addition later back into the deviled eggs. 3) Add your already boiled egg whites into the dye mixture, leave for approx 3 minutes and then rotate up. Once your eggs have the desired color, remove and pat dry with napkin. 4) Now it is time to create your yolk mixture. I crush my yolks in a bowl and then add Hellmans and mustard until I have the desired consistency I want. Most people prep these different, but since my family adores mine, I have learned to eyeball it over the years. You can also dust with some paprika if you want color. If you liked this article and would like to try this, do not forget to pin, stumble, or like so you have record! It also helps share with your friends and family and MomDot loves you for that! Have you done this with regular food coloring? I’d love to try it but the egg dying kits are well out of season now. Julie, I have not, but I imagine it would work the exact same way. Let me know if you try it! I love this idea…however I don’t know if the DYE is meant to be eaten. I think the reason we dye the shell is because we peel it off and toss it…not eat it. Most dyes in kits like this are vegi based, but overall as long as you make sure the dyes are food based its fine. There are always different kits so you should check yours specifically to verify. Happy Eastering! Try this recipe for the Boiled Eggs – I just found it, I haven’t tried it yet though. Making boiled eggs during Easter for coloring, egg hunts, or deviled eggs? I know I posted this last year, but here’s your reminder! Simpler, easier-to-peel and softer texture (the whites aren’t rubbery). You can make as many dozen at a time as you have muffin pans. Saves you tons of time, so don’t forget this one! Preheat oven to 325. Place a dozen eggs into a standard 12-count muffin pan. Bake for 25-30 minutes. Let stand 5 minutes. Place cooked eggs into a cold water bath. The eggshells may have some brown spots on them after baking, but these will wash off easily in the water. … and here I’ve always been trying not to crack the shells. This would be very cute served with a simple salad course for Easter. These colors are just amazing! I think I will do them with my boys this year! Thanks for the idea Trisha! You know I’ve never thought about doing this. The kids and I will be making for our Easter dinner! Very nice post. These are great for Easter–thank you for sharing! Beautiful!! I can’t ever get my unshelled eggs to look nice – I always make a MESS when I take the shell off. my husbands grandmother taught me how to do it. Once the eggs are done, let them cool completly (i put mine in cold water) Then ROLL them on the counter back and forth cracking the shell….then they peel perfect. Ill do a video for you next time. I have never had an egg problem since. I’ve tried that. Maybe I don’t let them cool enough first. Thanks!! I love this idea, Trisha. Will have to try it with the kids this year! What a cute idea! My kids would love this! They often take hard boiled eggs in their lunch and I bet they would love to have fun colored eggs! We made these last year, my family loved all the bright colors. Wow, those are amazing. I want to make these for my next party! I was thinking you could do green ones and call it GREEN EGGS and ham. LOL! That would be awesome. If you make the filling green too, it would be such a great party treat. I never ever would have thought of this.